Barkandji Country 5: Though this country is breathtaking in its color and redolent of a spirituality that can not be easily denied, this image, when enlarged to its full native resolution, is over 2.5 meters wide and clearly shows sheep around the dam whose cloven hooves have denuded the landscape of its natural cover. This leaves the topsoil without structure so the little soil that remains is prone to wind erosion. Euahlayi Country 1: Because of the natural abundance of vegetation and waterfowl, the ancient fecundity of the Narran Lakes wetlands has been reduced to almost nothing. Once a meeting place of First Nations for trade, festivals and intermarriage, now, with water taken by farming, there are only vestigial ponds that can no longer support the cultural significance they once did. The imperialist forces of the UK settled the continent, destroying the natural ecosystem in more ways than one. Sixty-two species of mammal have gone extinct, while half the 34 native species of fish are threatened. The Aborginal people were either exiles, diseased or otherwise killed by settlers. Today, the land is a symbol of late capitalism run amok, with climate change heralding the worst drought in 100 years, threatening the livelihood of inorganic businesses draining resources from the land including cotton, cattle and sheep farms. Perceiving the scope of climate change is daunting to realize – like the rotation of the earth of its axis, the consistently incremental changes go largely unperceived, so that it is only after the damage is done and the time has passed that we begin to understand all the warning signs flashing before our very eyes. 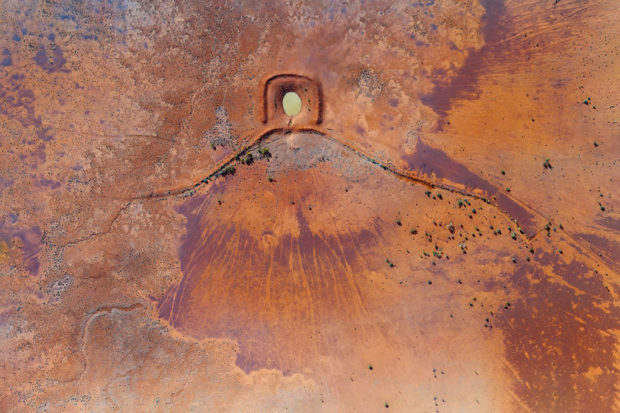 Australian photographer Paul Harmon has been making aerial photographs of the floodplains traditionally owned by the Barkandji, Ngemba, Euahlayi and Wayilwan Indiginous Nations, revealing the horrific impact of imperialism on the continent in his series, WaterMarks. 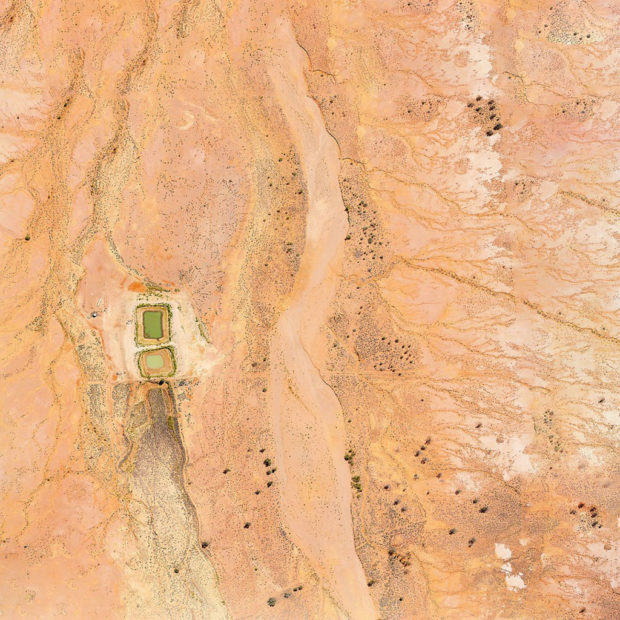 Harmon’s photographs are composites made with up to 120 images taken by drone at the legally permissible height of 120 meters from the earth, which were made in a series of expeditions over the period of a year. 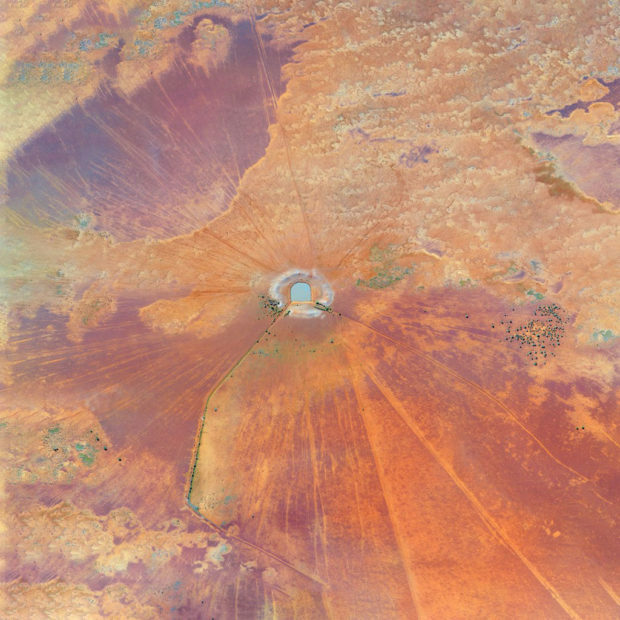 The images were then “stitched” together to produce a single that provides a deeply realized picture of the globe of the precipice of catastrophic change. “There are so many potential perils coming all at once. Not only climate change and the loss of bio-diversity but also a growing disconnect between labour and capital that is creating an ever-widening gap between the haves and the have-nots,” he writes. 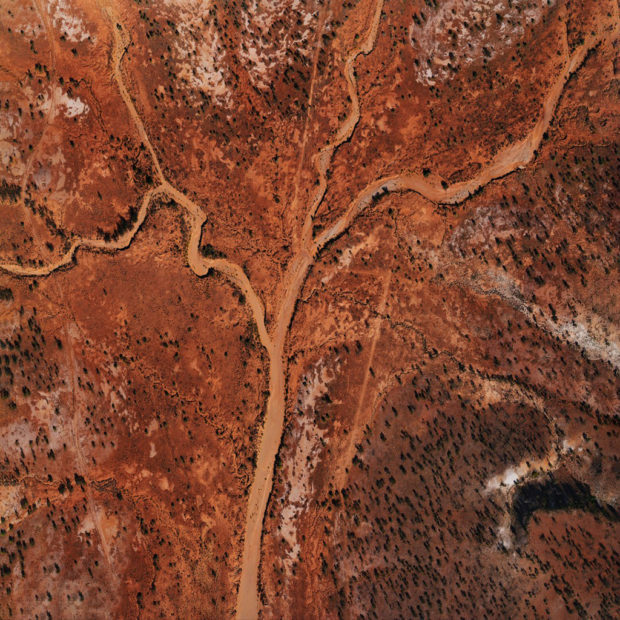 Harmon’s photographs document the destruction of the Australian landscape, as the native clans are no longer able to act as stewards to the environment that is their natural birthright. 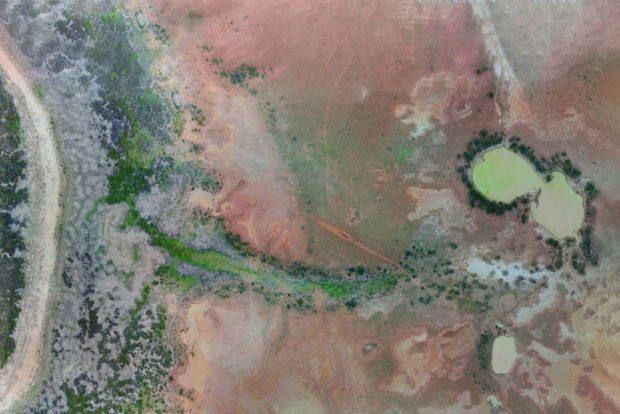 In WaterMarks, we see these regions, once verdant wetlands that provided fertile nourishment to a complexly layered ecosystem, have wasted away into figurative skin and bones. Harmon’s photographs speak of a desolate present informing a future we fear to dream, a hell on earth that is coming much sooner than we would ever date to think — begging the question: are we prepared for what the inevitable will bring? 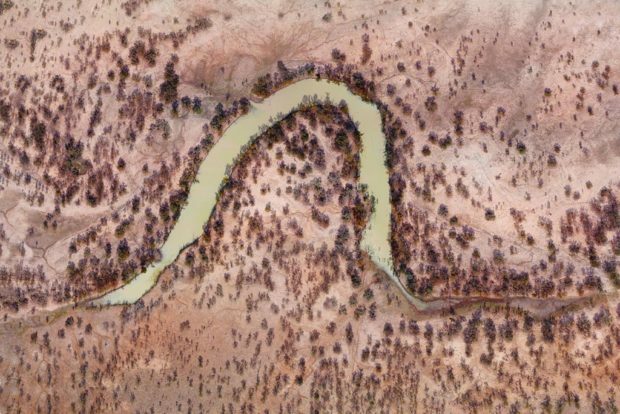 Bakandji Country 1: Though visually arresting, the western reaches of NSW’s Murray-Darling Basin are now in a perilous state. Where floods and drought used to alternate in a natural rhythm, the rivers and streams now very rarely flow. Instead the little rainfall the system receives is siphoned off to industrial scale farms – an abomination in this fragile landscape. Barkandji Country 2: Majestic from the air this beauty belies an ugly truth where a man-made dam supports cloven-hoofed cattle and sheep that have laid waste the natural environment. Barkandji Country 3: No longer prone to floods, where billabongs bridged the droughts, post-European settlers rely on man- made structures to keep their hand-fed cattle and sheep alive in this stunningly beautiful, but now overgrazed and therefore largely dead landscape. Wiradjuri Country 1: Griffith NSW is naturally arid country but has become an oasis of commercial cropping and cloven- hoofed animal farming through the use of irrigated water within the Murray-Darling basin. While this has benefited farmers and consumers, over-allocation of water is done at the expense of important wetland habitats and the associated cultural integrity of First Nations peoples. 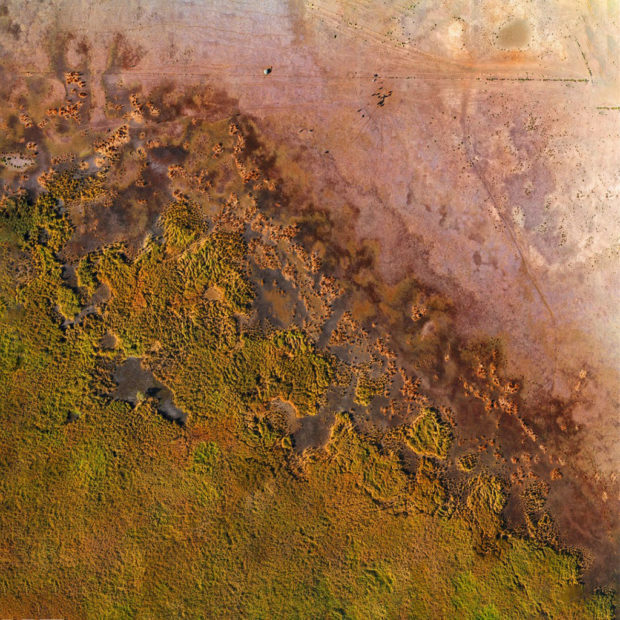 Wailwan Country 2: The Macquarie Marshes of central west New South Wales are listed under the international Ramsar Convention as an important wetland of south-eastern Australia. They are of international standing as a major waterbird breeding area with significant First Nations cultural values. However, with cotton farms sucking the rivers dry, little bird life remains in the small remnant marsh that is left. 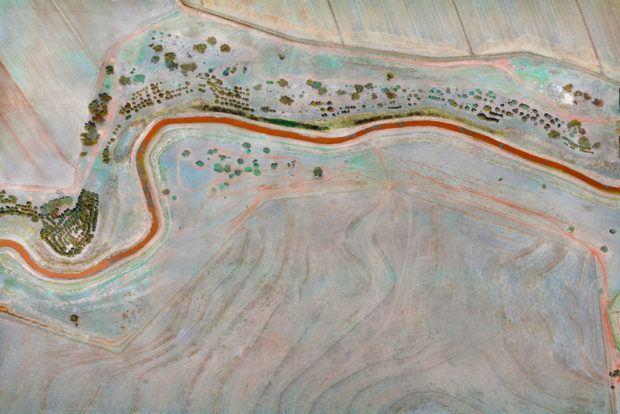 Ngemba Country 1: Along the Murray-Darling river system were a series of billabongs that would fill in flood. Later, a unique ecosystem in drought, they produced what First Peoples considered a natural antibiotic that would keep the river healthy when released in the next flood. Due to over-allocation to agriculture these floods rarely occur now and the health of the river has declined radically.